"These grilled lamb chops are inspired by both Italian and Indian cooking. The yogurt-based marinade includes aromatic spices like cinnamon, oregano, and rosemary." Whisk yogurt, lemon juice, lemon zest, chile paste, garlic, rosemary, oregano, salt, black pepper, and cinnamon together in a small bowl. Transfer into a resealable plastic bag. Add the lamb chops, coat with the marinade, squeeze out excess air, and seal the bag. Marinate in the refrigerator for 4 hours. Remove lamb chops from from marinade and scrape off excess. Discard used marinade. Season chops with salt and black pepper. Place on the preheated grill and cook until browned and medium rare on the inside, 3 to 4 minutes. An instant-read thermometer inserted into the center should read 130 degrees F (54 degrees C). Marinate for 4 to 10 hours for best results. I left some of the marinade on the lamb and broiled instead of grilling; it was fantastic! 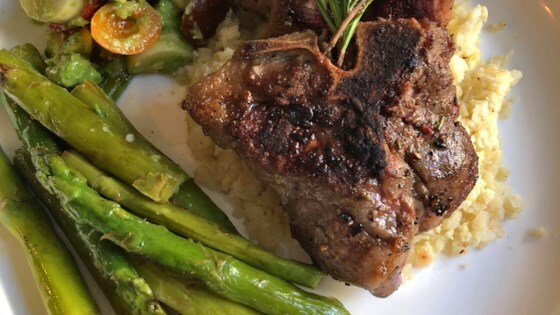 Best loin lamb chops I've ever made and I love to cook! Please don't change a thing with this recipe, it is PERFECT! These were crazy delicious. No changes. Not necessary. Two hours later we are still talking about how tender and tasty the chops were.